Aconitum nap 10x, 200c, 1M, Arg nit, Arsenicum alb 6c, 3030c, 200c, Avena, Passiflora, Scutelleria, Valeriana 4x, 7x, Calc phos, Causticum, Hyoscyamus, Nat carb, Silica 30c, 200c, Gelsemium 6c, 30c, 200c, Ignatia, Phos 6c, 30c, 200c, 1M, Lycopodium, Staphysag 6c, 30c, Pulsatilla nutt 30c, 200c, 1M, Stramonium 200c in 20% USP alc. in purified water. In acute cases, the doses can be given every 15 minutes, up to 4 doses. For cases that are not acute, one dose 3 times daily; this is often best started 5-7 days before any situation causing anxious behavior, e.g. before kenneling. Once a response is seen, administration should be reduced to 2 times daily and eventually once daily. When symptoms clear up, discontinue use. If reduction causes symptoms to worsen, original dosing may be continued a little longer before reducing. If a remedy is working well and dosing is not reduced, an aggravation of symptoms from overuse may occur. Stopping the remedy for 3 days will reverse the symptoms, and then treatment can begin as if using for the first time, weaning down as mentioned above. Pets Under 1kg - 2 drops in the drinking water 3 times daily. 2 drops in the drinking water once daily. Rabbits, ferrets, hamsters and pot bellied pigs can be dosed by weight as for cats and dogs in previous section. For severe cases a drop can be diluted in 1ml of water or other oral rehydration fluid and given to the patient orally, taking care to avoid aspiration of the fluid into the respiratory tract by the patient. 3 doses whose volume is appropriate to the size of the patient should be given from the diluted product over a 24 hour period, e.g. 2 drops for a mouse or small budgie, 4 drops for a large guinea pig. For acute cases it can be repeated as for cats and dogs in previous dosing section. Aconitum nap 10x, 200c, 1M, Arg nit, Arsenicum alb, Gelsemium 6c, 30c, 200c, Avena, Passiflora, Scutelleria, Valeriana 4x, 7x, Calc phos, Causticum, Hyoscyamus, Nat carb, Silica terra 30c, 200c, Ignatia, Phos 6c, 30c, 200c, 1M, Lycopodium, Staphysag 6c, 30c, Pulsatilla nutt 30c, 200c, 1M, Stramonium 200c in 20% USP alc. in purified water. In acute cases (those with sudden onset), the doses can be given every 15 minutes, up to 4 doses. For cases that are not acute (chronic long term problems), one dose 3 times daily; this is often best started 5-7 days before any situation causing anxious behavior, e.g. before a fireworks display. Once a response is seen, administration should be reduced to 2 times daily and eventually once daily. If reduction causes symptoms to worsen, original dosing may be continued a little longer before reducing. If a remedy is working well and dosing is not reduced, an aggravation of symptoms from overuse may occur. Stopping the remedy for 3 days will reverse the symptoms, and then treatment can begin as if using for the first time, weaning down as mentioned above. A caged bird can be medicated with 2 drops in the drinking water daily. 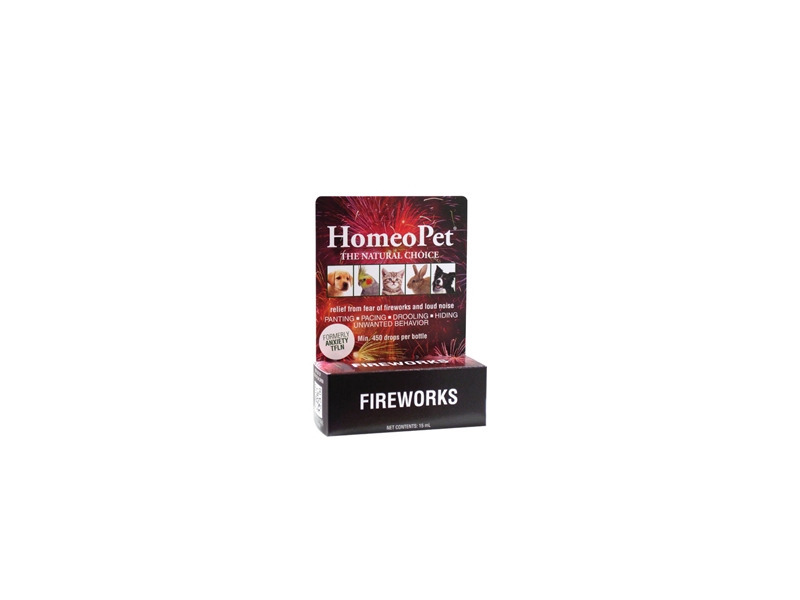 Optimally, the liquid preparation should be dropped directly into the mucous membrane of the mouth including lips; ideally in dogs by pulling out the labial pouch, and in cats by raising the head until the mouth opens. Where an animal finds this distressful, or an owner is unable to comply, the medication can be put in the food, water or milk. Where animals are sensitive to the odor of the alcohol preservative, a 10-20 minute period should be allowed for dilution and evaporation before the liquid or food is presented to the patient. Occasionally, animals will shake their heads as a response to the alcohol preservative; cats may salivate excessively and in these cases, presenting it in food, water or milk works. It can also be added to a sprayer and misted in the air around severely affected patients to calm them down. Travel sickness, motion sickness, fear of travel, anxiety getting into a vehicle, anxiety even at the sight of a vehicle, some cases of claustrophobia, fear of getting down off a height. Vertigo from travel or other disturbance of balance mechanism, even with head injury. 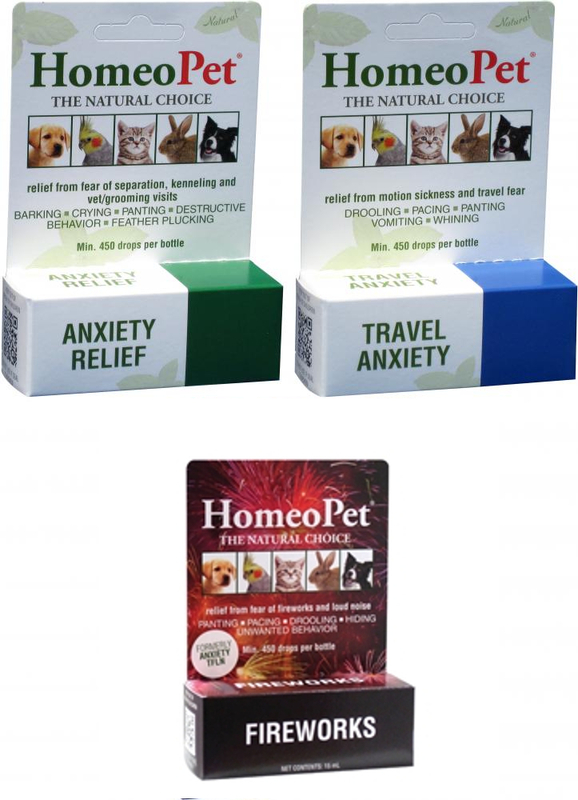 Some cases of anticipatory anxiety will respond such as fear of public places, or fear at a dog show, especially in a patient who also shows travel sickness. Nausea, vomiting, drooling and salivation with nausea even without motion sickness. Borax 6c & 30c (Borate of Sodium), Cocculus 6c & 30c (Cocculus indicus), Colchicum Autumnale 6c & 30c, (Meadow Saffron), Passiflora 6c & 30c (Passion flower), Valeriana 6c & 30c (Valerian Root). Over 45 kg - 20 drops. In acute cases (those with sudden onset), the doses can be given every 15 minutes, up to 4 doses. For cases that are not acute (chronic, long term problems), one dose 3 times daily; this is often best started 5-7 days before any situation causing anxious behavior, e.g. before traveling. Once a response is seen, administration should be reduced to 2 times daily and eventually once daily. If reduction causes symptoms to worsen, original dosing may be continued a little longer before reducing. If a remedy is working well and dosing is not reduced, an aggravation of symptoms from overuse may occur. Stopping the remedy for 3 days will reverse the symptoms, and then treatment can begin as if using for the first time, weaning down as mentioned above. Optimally, the liquid preparation should be dropped directly into the mucous membrane of the mouth including lips; ideally in dogs by pulling out the labial pouch and in cats by raising the head until the mouth opens. Where an animal finds this distressful or an owner is unable to comply, the medication can be put in the food, water or milk. Where animals are sensitive to the odor of the alcohol preservative, a 10-20 minute period should be allowed for it to dilute and evaporate before the liquid or food is presented to the patient. Occasionally, animals will shake their heads as a response to the alcohol preservative; cats may salivate excessively and in these cases presenting it in food, water or milk works. It can also be added to a sprayer and misted in the air around severely affected patients to calm them down. Below are some recent questions we've received regarding HomeoPet Anxiety Homeopathic Remedy, including answers from our team. Length of time before travelling. 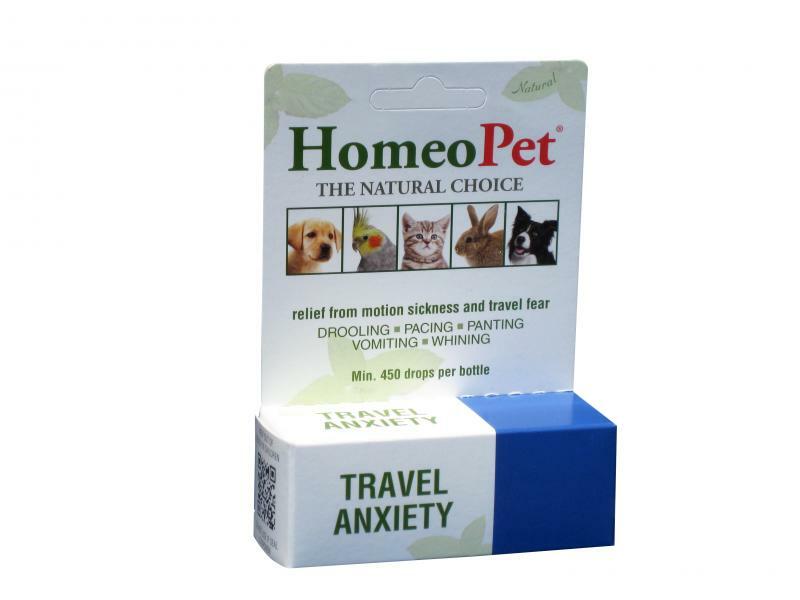 How long before travelling does this need to be given to my dog, she gets motion sickness. It is recommended that you give one dose three times daily 5-7 days before travelling (if you are going on a long journey). For longterm use you can then reduce the dosing to twice daily then eventually once daily. If you are intending to use this supplement as one off doses then you should give it 30 minutes before travelling.